In the midst of the Great Smoky Mountains and the Blue Ridge Mountains, Western North Carolina’s Jackson County is teeming with trails. 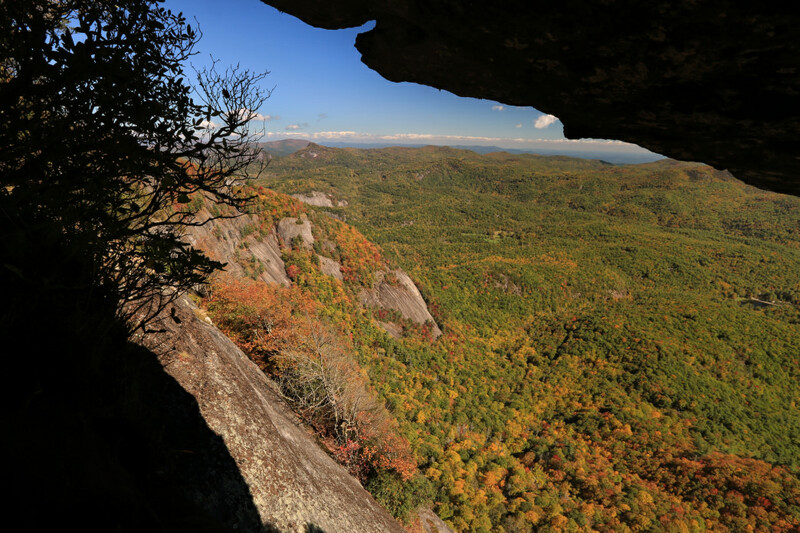 There’s enough here to appeal everyone, from seasoned peak baggers pursuing southern Appalachian ‘sixers’ (peaks over 6,000 feet) to burgeoning nature lovers that are just discovering the beauty of the outdoors. With so many options, why shouldn’t epic outdoor adventures include the whole family? Considering the vast network of trails running through Jackson County, here are some of the best hikes for the everyone in your crew (including the tail-wagging, canine members). Looming above the Shining Rock Wilderness, the treeless summit of Black Balsam Knob is blessed with some of the Blue Ridge Parkway’s most intoxicating vistas. For backpackers, the iconic Appalachian bald is one of the highlights of the 30-mile Art Loeb Trail, but the airy summit is just as accessible for young hikers that aren’t quite ready for a multi-day backcountry excursion. By beginning off FS 816 (located at Blue Ridge Parkway milepost 420), a brief 0.75-mile trip along the Art Loeb Trail leads hikers through windswept alpine meadows to the 6,214-foot summit. The absence of trees means the peak affords 360-degree views of the Smoky Mountains, Cold Mountain, and the rippling peaks of the Mount Mitchell range—all providing the perfect backdrop for epic family photos. Perhaps best of all, the panoramic views begin early as the trail quickly emerges from a fringe of balsam forest and threads through mountain meadows flecked with wildflowers bursting into bloom. The hike to the base of the falls is short but steep 0.7 miles. Under regular conditions the 100-foot flume tumbling over the Tuckasegee Gorge is stunning enough, but over a handful of days between April and August, High Fallsare transformed into a mighty torrent of whitewater thanks to the release of the Lake Glenville Dam. The hike to the base of the falls is short but steep at only 0.7 miles (for 1.4 miles round trip), and is suitable for older children who are able to tackle the descent to the river. While the short trail has some steep ups and downs and obstacles like stone steps and hemlock-log bridges, the newly-hewn route is easy to follow. After the hike, tack on a visit to Lake Glenville’s family-friendly swimming beach, located in the Pines Recreation Area adjacent to the trailhead for High Falls, for a whole day of water fun. Towering over the southeastern corner of the Great Smoky Mountains National Park, the wind-pummeled summit of the 6,292-foot Waterrock Knob (at milepost 451 on the Blue Ridge Parkway) affords spectacular views of the final leg of the scenic route. While the peak is the highest in the Plott Balsam Mountains, the summit of Waterrock Knob is one of the most accessible ‘sixers’ in the entire range, and is easily scalable along a well-maintained trail beginning at the Waterrock Knob Visitor Center. Although steep in stretches, the out-and-back trip to the summit is only 1.2 miles, and has a few conveniently-placed benches. From atop the rocky pinnacle, climbers have 360-degree views of the Smokies, Maggie Valley, and the closely-condensed peaks of the Plott Balsams. 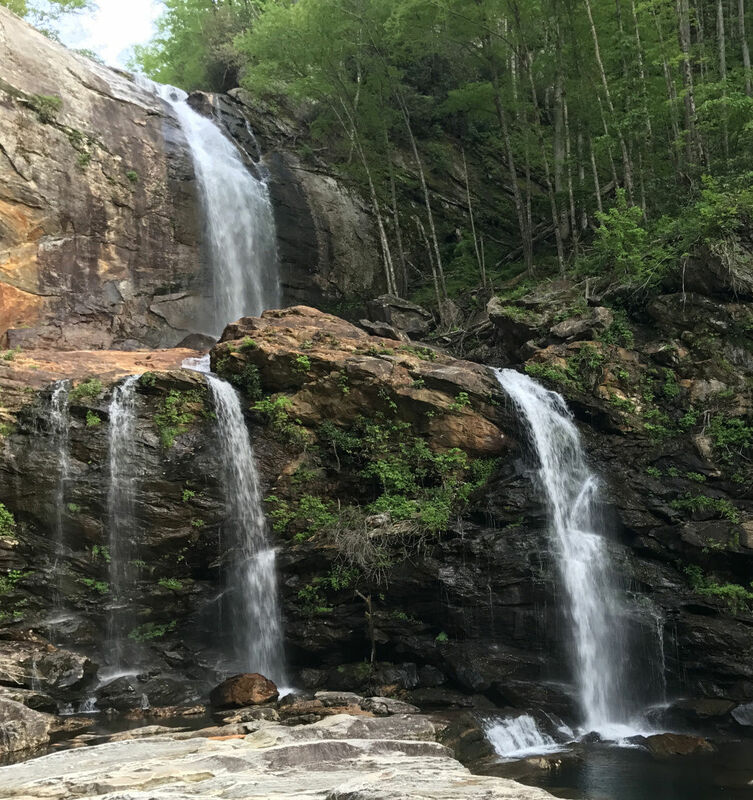 Located just outside Cashiers in the Nantahala National Forest, an effortless quarter-mile trek leads to the ultimate summer escape—a family-friendly plunge pool fed by Silver Run Falls. The hike begins as a leafy forest stroll, crossing the headwaters of the Whitewater River courtesy of a footbridge, before arriving at the two-pronged cascade. The falls tumble nearly 30 feet into an epic swimming hole bordered by a ring of rocks and with a variety of vantage points for photographing the flume. One of the most recognizable natural landmarks in the Nantahala National Forest, the barren cliffs of Whiteside Mountain almost look like icy glaciers sliding down the sides of the peak. Marbled with ribbons of quartz and feldspar, the precipitous 750-foot cliffs dominating the façade of Whiteside Mountain are also the highest east of the Rocky Mountains. Despite soaring to a height of 4,930 feet, the summit of Whiteside Mountain is easily accessible by a 2-mile loop on the Whiteside Mountain Trail. The trek is peppered with panoramic vistas, particularly along the peak’s crest, which is enough to boost the morale of even the most unenthusiastic hikers. The route is also studded with educational signs highlighting points of interest, like the story of Fools Rock, the location of a daring mountain rescue in 1911. Local Charlie Wright free climbed down the mountain’s face to save a fallen picnicker named Gus Baty, who spent several hours dangling perilously while clutching an overhanging bush. Located along the loftiest leg of the Blue Ridge Parkway (milepost 427), the Wet Camp Gap Trail is a family-friendly ramble renowned for the bounty of wildflowers along the route. Budding naturalists should keep an eye out for spicebush swallowtail butterflies hovering over the brightly-colored seasonal blooms, including goldenrod, green-headed coneflower, bee balm, and featherbells. The 1.3-mile trek is also utterly flat (with just 60 feet of elevation change) and leads hikers to a meadow-filled ‘gap’ in the midst of Rich Mountain, framed by fuchsia-flecked bunches of mountain laurel. During the summer, the route is also popular with blueberry pickers. Richland Balsam might be the loftiest point in the Great Balsam range (not to mention one of the highest peaks on the East Coast), but the trip to the summit from the Blue Ridge Parkway is both short and gradual. Beginning from the parkway’s Haywood-Jackson Overlook at milepost 431, a gentle 1.5-mile loop winds through a fragrant, cloud-smothered slice of evergreen forest. Along the route, the refreshingly crisp alpine air is scented with pine, and the shadowy spruce-fir forest has a distinctly mystical vibe, sure to enchant young children. While we haven’t seen any woodland gnomes beneath the fern boughs fringing the trail, the high-elevation forests along the Blue Ridge Parkway are a global hotspot for salamanders, sure to delight budding herpetologists. After getting in a family-friendly hike, stick around and see what else Jackson County has to offer. With everything from paddling to mountain biking and tons of festivals and events year round, you could easily spend a weekend (or more!) exploring this outdoor adventure hotspot. Plan your adventure today! Get a copy of our Visitors Guide here.